Now, four out of the five of these polishes I bought in Canada, so I think they are going to be next to impossible to find for my fellow U.S. Americans. Side note: Do you know the sales taxes in Canada (or at least in Ontario) are like, 13%? Ugh, it’s painful! It was like a dagger through the heart whenever I went to pay for anything. If I was Canadian, I would totally come to the U.S. to shop for stuff…. Except for these nail polishes. Let’s start from the left. 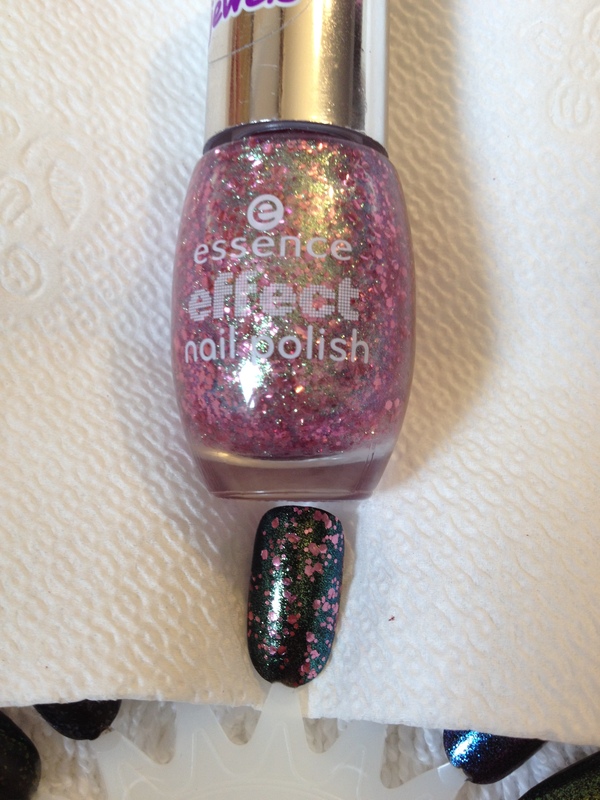 This is Essence Effect – Glitz & Glam. Here I have it swatched over black. It’s a clear base with small and medium size pink hex glitter with a mint green shimmer running through it. 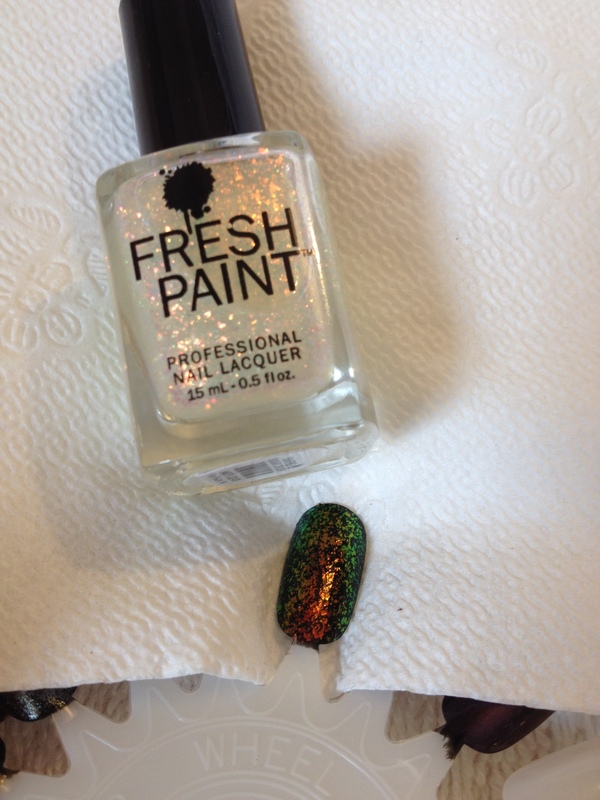 When it’s worn over a dense pink glitter polish, the green shimmer sort of gives a duo-chrome effect. 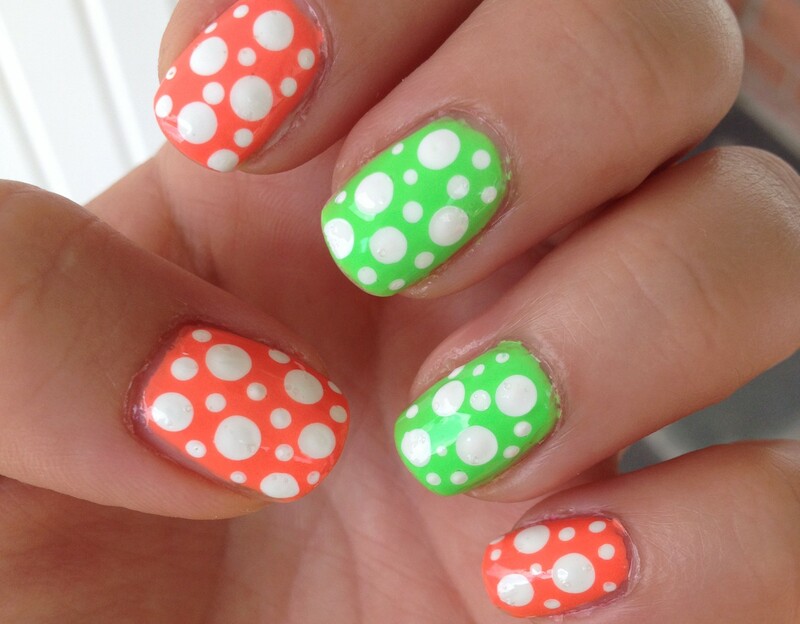 This also looks cool over a mint green polish. I got this in Canada, but I think you might be able to find these at Ulta. Not sure. Joe Fresh – Twilight. 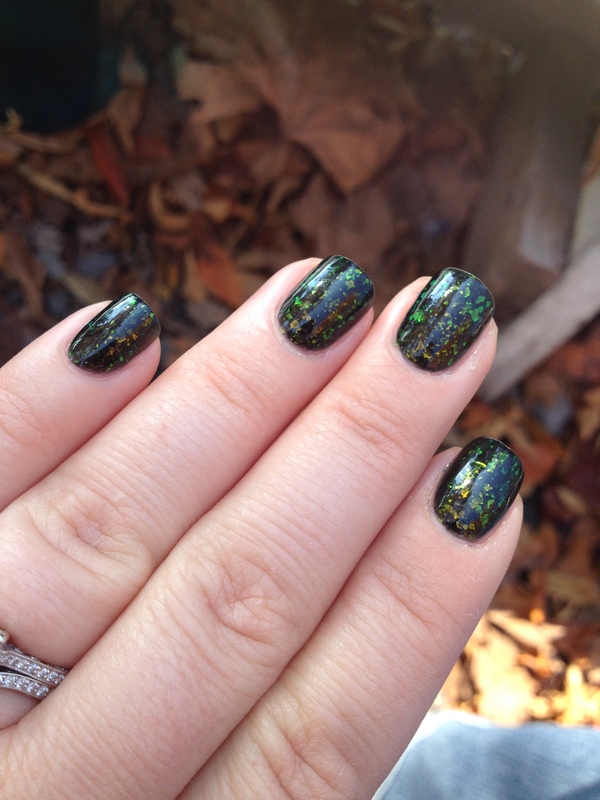 This is a flaky polish, but the base is a sheer black instead of your typical clear. I think it took 3 or 4 coats to get the desired effect, but it was so worth it! When I had this on, I could not stop looking at my nails! 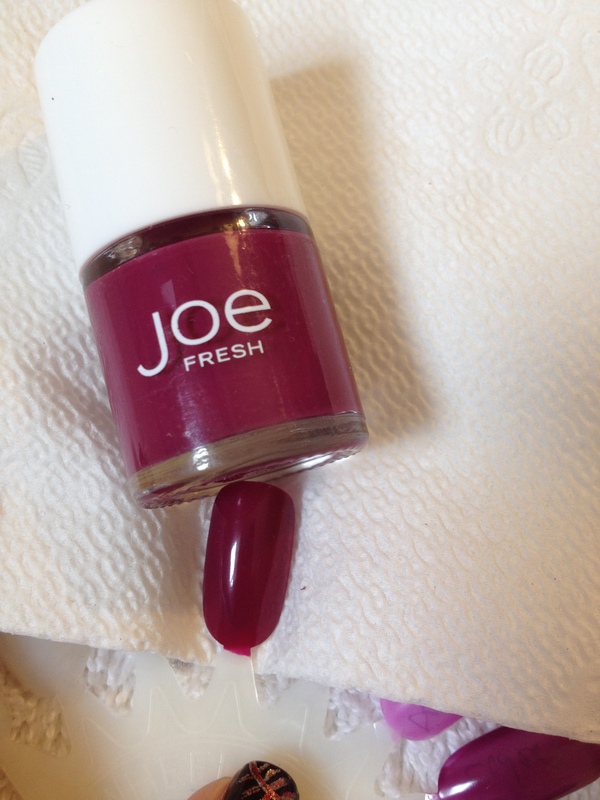 Joe Fresh – Bumbleberry. I don’t think that’s an actual type of berry…. Unless is some sort of exclusively Canadian berry. Anyway, this picture does not do this polish justice. I messed around with my lighting, and I just couldn’t capture the true color. This polish is much more purple in real life. It’s just a really beautiful berry color. It seems like it should be a really common color, but I didn’t have anything really close already in my collection. It’s on my toes now. It’s just a perfect girly fall color. 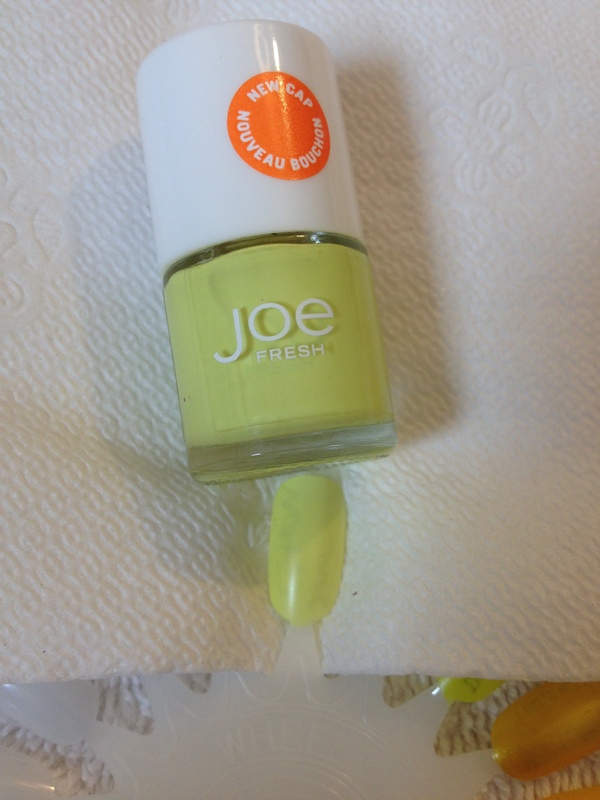 Joe Fresh – Sour Citron. This is an almost neon color that straddles the yellow/green fence. It’s the perfect color to top with a glow-in-the-dark topper for all of your Halloween activities. The formula is really great on this, too. Usually colors like this are super sheer, but I think this only took 2-3 coats to get the color you see in the bottle. Fresh Paint – Sugar Crush. Ever since I got this polish back in the summer I have been eagerly anticipating October, just so I could wear it over black. It’s just amazing. I could go on and on, but I’ll spare you. By the way, as far as I can tell, this is a perfect dupe for Essie – Shine of the Times. I promise that I won’t keep you waiting forever for my next post! I know all of you have nothing better to do than to keep refreshing your screen on my website to see if I put up a new post. (That’s some tongue-in-cheek, there.) Thanks for reading and commenting! 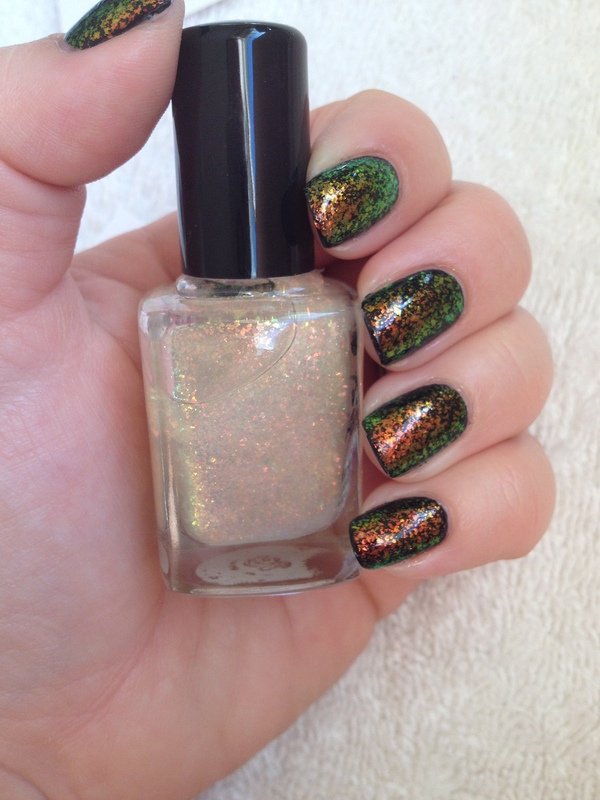 This entry was posted in Favorites and tagged bumbleberry, dupe, essence effects, fresh paint, glitz & glam, glitz and glam, joe fresh, october favorites, shine of the times, sour citron, twilight. Bookmark the permalink.